Fire cider is a folk remedy used to increase your circulation, warm your insides, and kick cold and flu symptoms to the curb. Also called “Master Tonic” or “Mother Tonic,” it is used in conjunction with elderberry syrup and echinacea tincture, to strengthen your immune system. Use it this winter. It’s very easy to make, especially if you have the ingredients on hand from your own garden. If you have to buy the ingredients, purchase organic ingredients, as the vitality of the herbs are stronger when grown organically, on naturally fertilized soil. 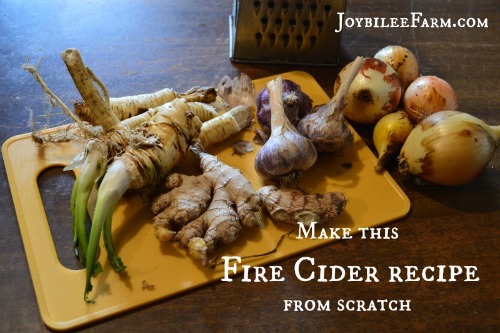 Most fire cider recipes come from adaptations of Rosemary Gladstar’s folk remedy.. This is my version. I add turmeric and astragalus for the extra immune boost and warmth. Prepare all ingredients. Layer in 1 quart, mason jar. Fill jar with vinegar. Use a chop stick to release any trapped air. Cover with more vinegar, so that all vegetables are completely covered with vinegar. Let sit for 4 to 6 weeks, at room temperature. Shake daily or as often as you think of it. Note: 1 1/3 cups of honey equals 1 lbs. of honey. Rosemary Gladstar recommends taking 1 tsp. of fire cider a day during the winter to warm the body, boost the immune system, and enhance circulation. Take 2 tbsp a day at the first sign of cold or flu, to help your body deal with it quickly. 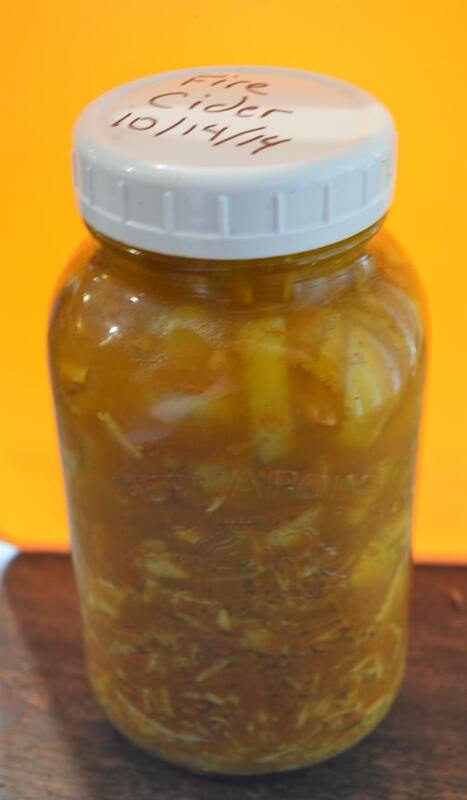 Add Fire Cider to salad dressings, put a tsp in a bowl of soup, or just take it right off the spoon. I actually like the taste, without the honey. Honey soothes a sore throat and cough though, so if you have a sore throat consider adding the honey. How long does the Fire Cider last? A season? If you haven’t used it up and it’s kept refrigerated, it should be good for a longer than a year. If it doesn’t smell “off” it is fine. But most people use it up within a year. The vinegar keeps it from going bad. Would this be safe for my pregnant wife? Maybe leave our the astragulus? Would shallots work instead of onions because that’s all we grew this year? I’d leave out the astragalus, but the other herbs are cooking herbs. If she’s in early pregancy though, she might not be able to stomach it. But you can make this up and then use it as part of a salad dressing or as a condiment. Also you can use the herbs as cooking herbs individually and she would benefit from the immune boost. Ginger actually gets more potent when cooked in an oil, like coconut oil. I didn’t read the recipe properly and I added the honey in with all the ingredients immediately. Is my fire cider ruined? You should be ok. You’ll need to watch it for fermentation, as the extra honey may trigger the alcohol in the symbiotic bacteria in the vinegar to over grow. That won’t harm it but it may cause the pressure in the jar to increase. If you notice pressure building up in the jar, pop it in the fridge and loosen the cap. The alcohol won’t cause a problem in the medicine though. I dehydrated the leftover vegetable matter from my fire cider and ground it. Now I use it to season eggs, potatoes and fish…so good! !